Over the last three decades enormous effort has gone into strengthening public health information systems (HIS). They are now a key element of health sector reform initiatives, but are growing in complexity. This is driven by the increasing diversity of technology platforms, increasing demands for information, the multitude of actors involved, and the need for data security and privacy. Initiatives like Universal Health Coverage and Prevention of Non-Communicable Diseases are expected to place further burdens on all health systems. However, they will pose particular challenges in resource-constrained settings, such as low- and middle-income countries (LMICs), where health systems have struggled to provide quality care. 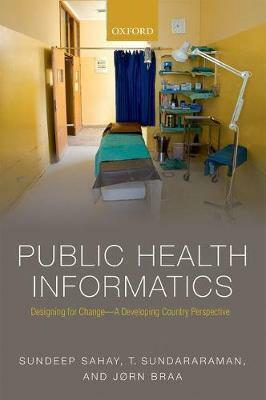 Public Health Informatics discusses the challenges that exist in the design, development, and implementation of HIS. Key problem areas, such as sub-adequate data and problems of inter-operability, are analysed in detail and the book looks at possible approaches to addressing these challenges in LMICs. Case studies critically appraise the experiences of countries and health programmes in the building of HISs, to determine the successes and failures of varying approaches. Finally, the book explores how future systems in developing countries can be shaped.The expert author team has two decades experience in over 30 LMICs, and includes researchers and practitioners from the fields of informatics, public health, and medicine. This uniquely comprehensive account of information systems in the public health setting will be of use to the wide range of people working in this broad cross-disciplinary field, from software developers to public health practitioners and researchers.